When our Goldfish get sick or injured, the first action is to isolate them in our hospital tank. The problem is, most of us don't have our hospital tank ready and waiting for its next patient. Sooner or later we will notice one or more of our Goldfish displaying signs of illness. We immediately go into paramedic mode and start setting up our hospital tank. The problem is, the hospital tank is usually only a temporary set up so sometimes short cuts are taken that put the patient in more danger than from the ailment. Any suitable sized container can be used as a hospital tank, but one around 60 liters (16 US gallons) is ideal for most applications unless you are treating a large pond fish. One of the big advantages of using an aquarium is you can more easily observe the fish. It’s hard to see if a fish is feeling better and has its dorsal fin up when looking from above. 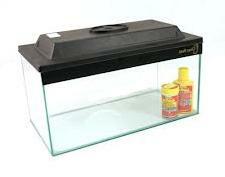 Any container other than a dedicated aquarium can be contaminated by chemicals. Buckets have multiple uses such as for weed spraying and washing the car. Both activities use chemicals highly toxic to fish. A hospital tank will only be used for a short period of time, but if it is a glass aquarium it should still be set up on a strong supporting structure with polystyrene underneath. A hospital tank should be bare, apart from necessary equipment such as a thermometer, possibly a heater, subdued or no lighting, and some way of aerating the water, either by air diffuser or a filter. If a fish is particularly nervous, artificial plants can be used to provide a hiding spot. Don’t use hard ornaments as a fish can charge into them if startled. The tank must have fresh, clean, conditioned water at the same temperature and pH (or higher), than the water the fish is currently in. Don’t use the water it is currently in, as it may be the cause of the problem. If a filter is to be used, you can’t treat the fish with any anti-bacterial medications. Even salt suppresses some bacterial growth, which is good for treating the fish, but not so good for the beneficial bacteria in the filter. If a cycled filter is fitted to a hospital tank that has anti-bacterial medication in it, there will be an ammonia spike from the killed bacteria. I would take out all the filter media and use it for water circulation only unless the media can be spotlessly cleaned. Provide aeration if a filter isn’t fitted. Low oxygen levels caused by Increased water temperature, small water volume and damaged gills will cause additional stress to the patient. Don’t create an excessive current from aeration or the filter that the fish has to fight against as this wastes precious energy. If increased heat is required for treatment, don’t just dangle the heater in the hospital tank. Make sure it is secured so a large fish can’t knock it against the side and break it. For plastic containers make sure it isn’t touching the sides or bottom. Keep the hospital tank covered. Single tailed varieties will jump if distressed. Feed the best food available. Poor quality foods quickly pollute small water volumes. Ideally, water based live food such as daphnia are best, both to preserve the water quality and speed up recovery. If only dry prepared food is available, feed sparingly. Make frequent large water changes, making sure the temperatures are the same. Nothing stresses a sick fish more than a large temperature fluctuation. Don’t forget to replace lost medications. As a first step, always put a sick Goldfish into a mild un-iodized salt bath, whatever you think the illness may be. This boosts its immune system and may be all that is necessary for treatment. Other medications can be mixed with salt. And as a final word of caution, avoid cross contamination of your other fish from equipment such as nets and siphon hoses, and completely sterilize the tank and equipment when it is put back into storage as some diseases can survive drying out.